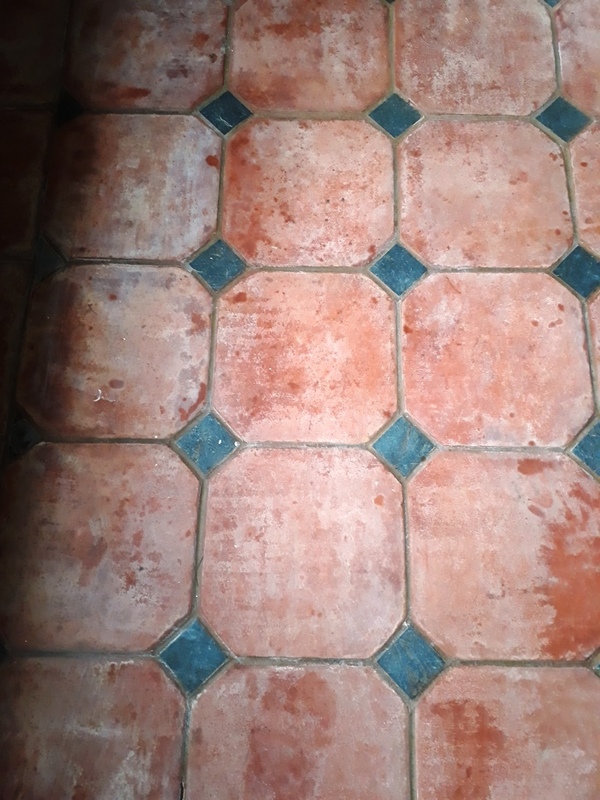 How the Terracotta floor tiles at this property in the Village of Hales, Norfolk became quite so comprehensively dirty in so short a time, we will never know. We were contacted by the new owner, a lady who had become so distressed by the state of the floor in the house she had recently bought that she was seriously considering ripping up the entire area of tiling and replacing it. Remarkable particularly because the property had been restored only a couple of years ago, the kitchen and hallway being laid with new terracotta tiles. The entire surface was deeply ingrained with soiling and the pointing lines were filthy, despite there being evidence of some kind of topical sealer having been applied at the time of installation. It quickly became obvious during testing that the sealer had been applied very sparingly and had mostly worn away, leaving a badly compromised fluid and soiling resistance with a dull and dirty finish which refused to clean up when mopped. 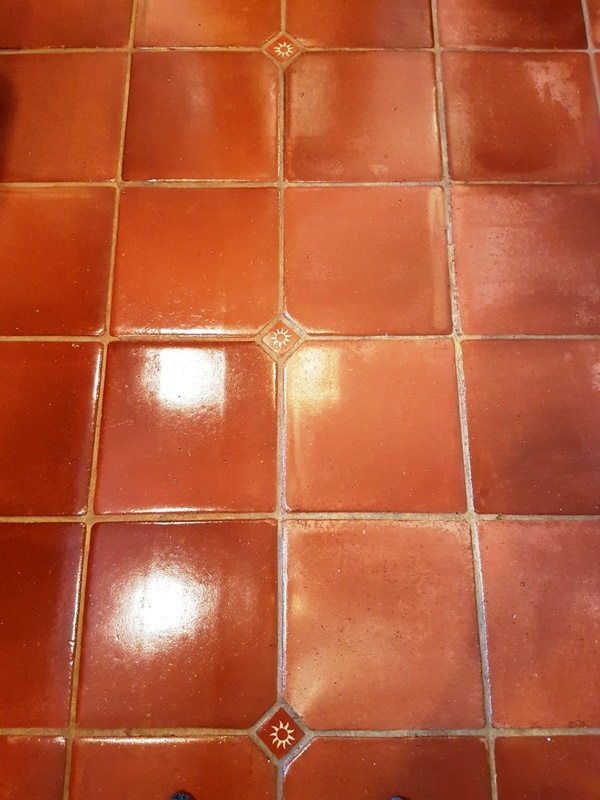 The tiles turned out to be made of a fairly soft terracotta which meant that we were able to deep-clean them extremely effectively using a strong dilution of Tile Doctor Pro-Clean (one part Pro-Clean to two parts water). A strong dilution was required to remove what remained of the old sealer in the less used areas and strip the surface back to the bare tile. The Pro-Clean was left to soak into the floor for about ten minutes before being worked in using our heavy rotary machine fitted with a black scrubbing pad. The resulting slurry being power rinsed and vacuumed away with our 400psi Ninja machine. All the dirt and virtually all of the old sealer was removed at this stage; the remaining patches around the edges of the area being finished by hand with a 200-grit hand-held burnishing block. The pointing lines were then cleaned by hand with neat Pro-Clean and an angled grout brush. Finally, the deep-seated oil stains in front of the cooker were brought out using Tile Doctor Oxy-Gel which was left to dwell on the marks for an hour before being agitated with a diamond burnishing pad and rinsed away with the Ninja machine. 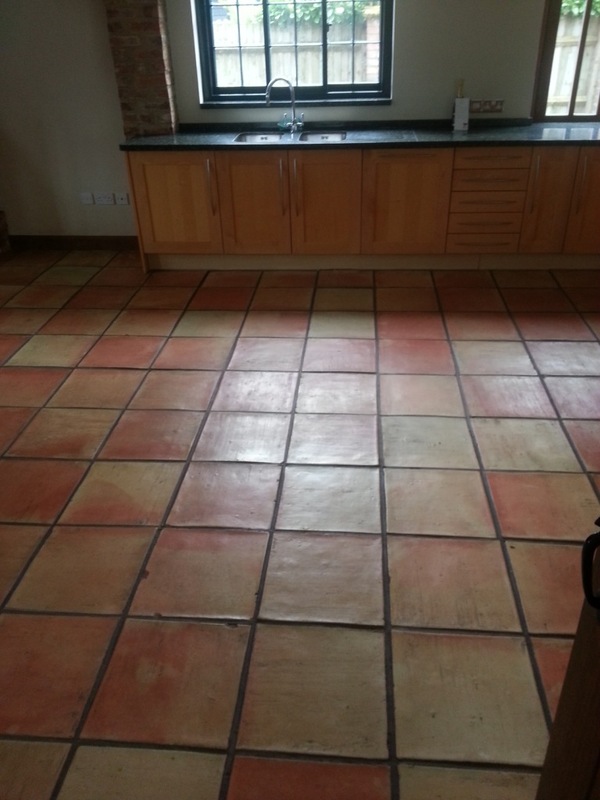 The floor was then left to dry thoroughly overnight with assistance from our dehumidifier. 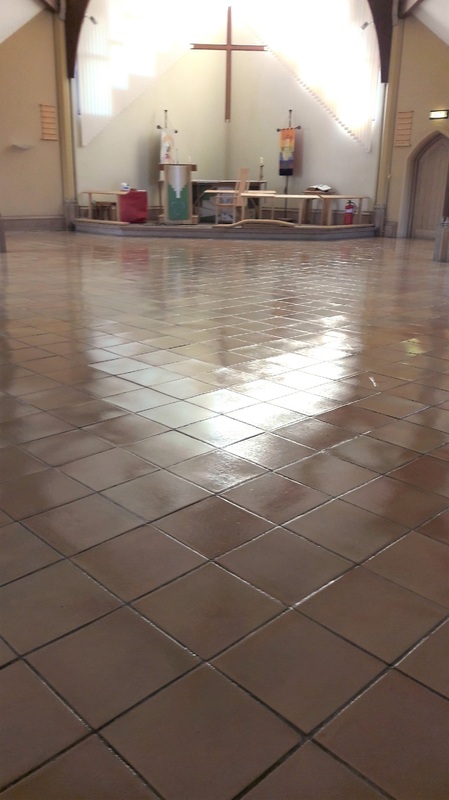 Owing to the softness and consequently high porosity of the substrate, we realised that it could take up to ten coats or more of our chosen sealer in order to achieve the level of shine our client had requested so that the daily mopping would be effective. Our usual solution to enable us to complete the work in one day would be to apply a coat of penetrating Tile Doctor Colour Grow sealer to the tiles first, followed by up to five coats of topical sealer which would provide the finish, but because our client loved the new lighter colour of the cleaned tiles, Colour Grow was not an option as it is designed to enrich and thereby slightly darken the colour. 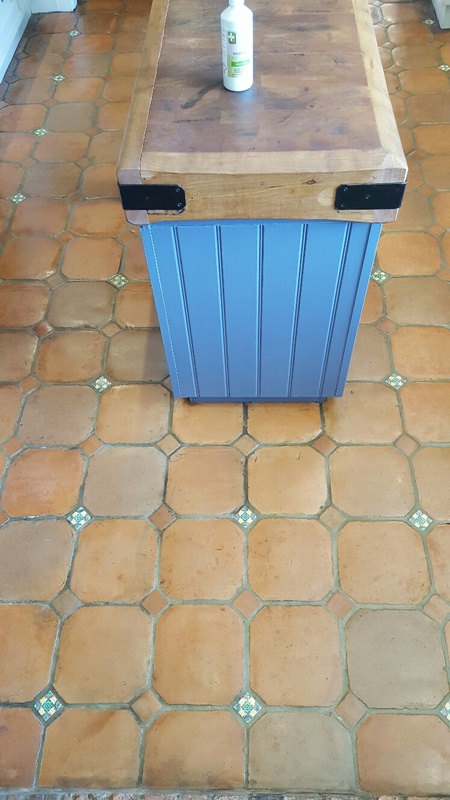 The solution therefore was to apply a single coat of Tile Doctor Ultra-Seal which, like Colour Grow, is a solvent-based penetrating sealer but doesn’t alter the colour of the material. This was followed by five coats of Seal & Go to further improve the fluid resistance and provide the mid-sheen finish required. 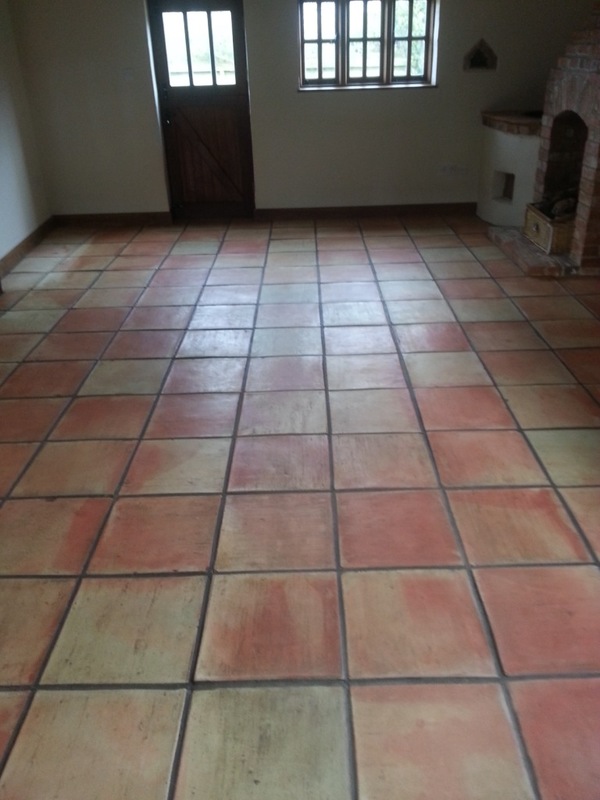 We had a request to visit a beautiful Barn conversion on the Essex side of the market town of Bishop Stortford, the lady of the house was concerned about her Terracotta tiled Kitchen Floor which was dirty and had become difficult to maintain. 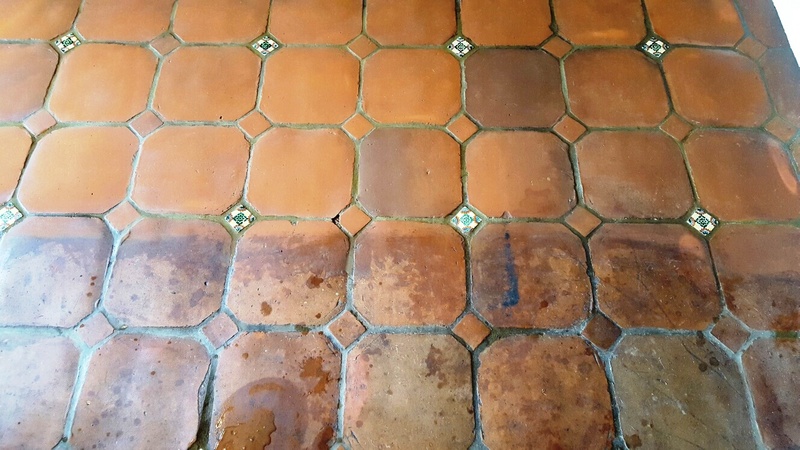 After taking look I could see that the sealer had worn down and was no longer preventing dirt from becoming ingrained in the pores of the Terracotta tile. 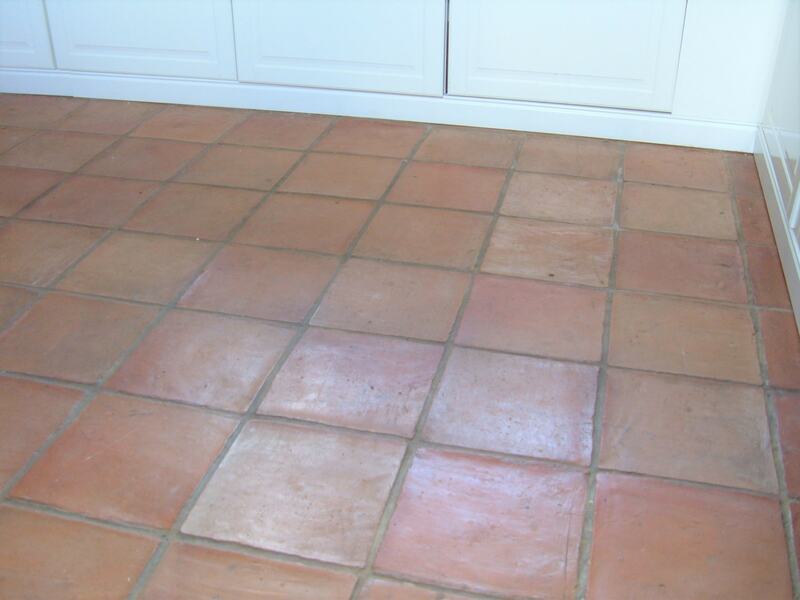 This is a common problem with Terracotta which needs a sealer in place if you want to keep the floor looking its best. I recommended we strip off what was left of the old sealer, give the floor a thorough clean and then re-seal it over the course of two days. As it turns out the floor had not been cleaned and resealed in ten years, so my client was happy for me to do the work. 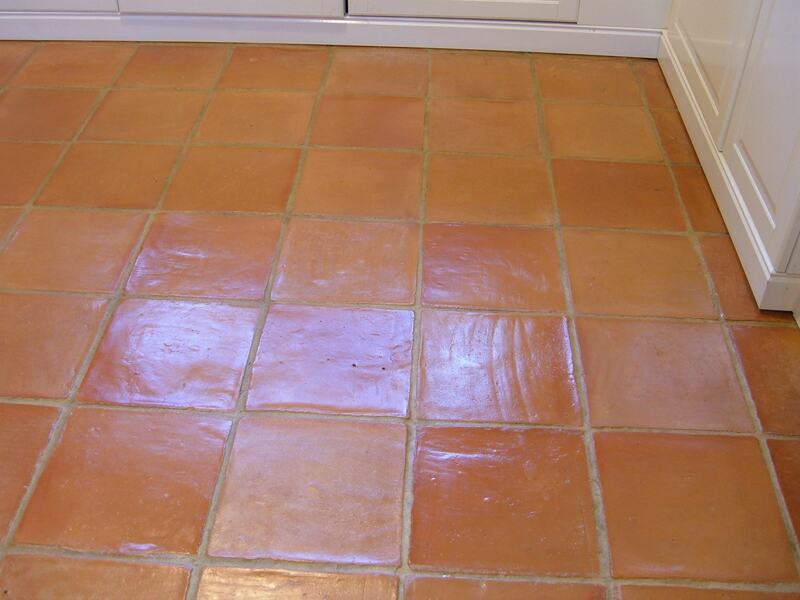 The first step was to strip the floor off any remaining sealer using a strong dilution of Tile Doctor Pro-Clean. The solution was left so soak into the tiles for about twenty minutes before being scrubbed in with a black scrubbing pad fitted to a rotary floor buffer. At this point I also ran a stiff grout brush along the grout lines to get those clean as well. The now soiled cleaning solution was rinsed with water and mopped off the floor. 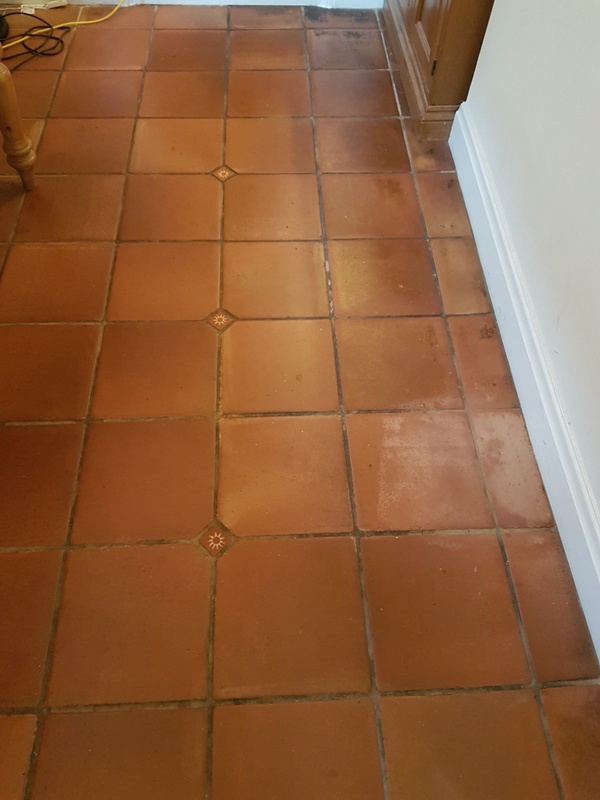 Any stubborn marks were then retreated using the same process and when I was happy that the floor was clean the floor was given a thorough rinse to remove any trace of cleaning product. 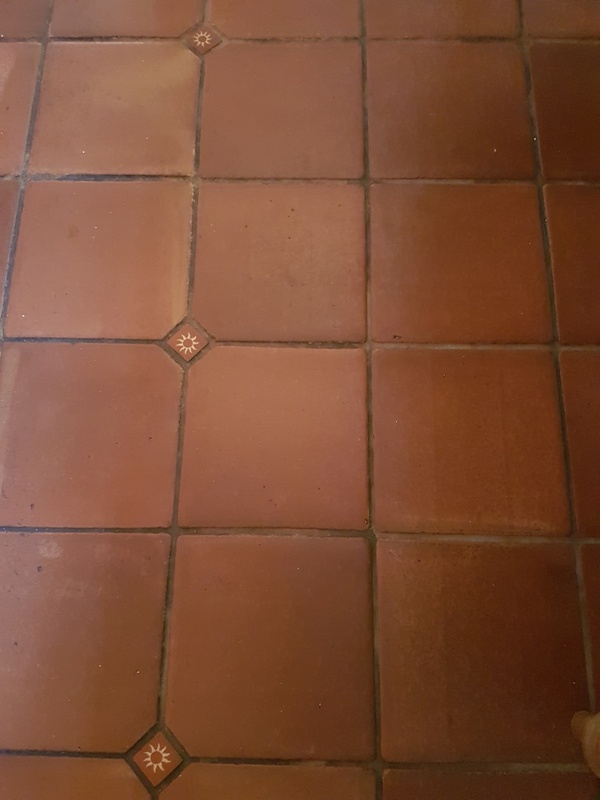 Having removed the old sealer and cleaned the tile and grout the next step was to apply a new sealer however the tiles needed to be dry to do. I decided therefore to seal the floor the following day and left an industrial air mover in place overnight to help dry out the tiles. Returning the next day to seal the floor I checked the floor first to make sure it was dry. 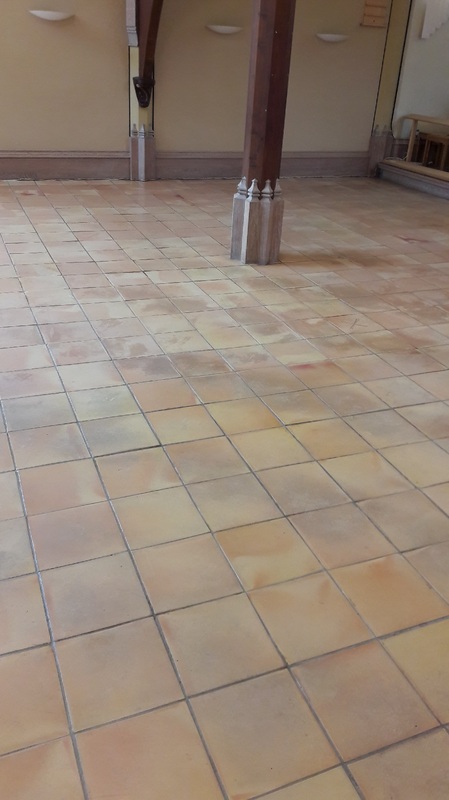 All was well, so I proceeded to seal the floor starting with a base coat of Tile Doctor Colour Grow which is an impregnating sealer that soaks into the pores of the tiles, protecting them from within whilst simultaneously enhancing the colours in the tile. 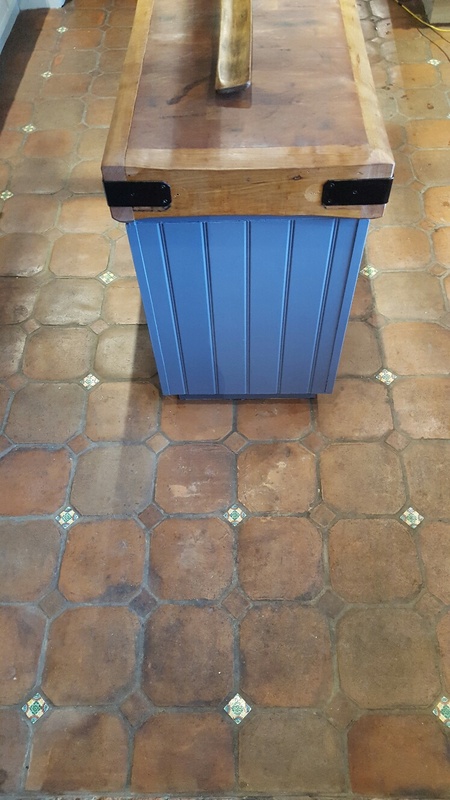 Once the Colour Grow had dried I followed up with three coats of Tile Doctor Seal and Go Extra which like Colour Grow is a fully breathable sealer that lets moisture rise through the floor. Colour Grow however is a Matt sealer whereas Seal and Go adds a gives the floor a nice sheen. 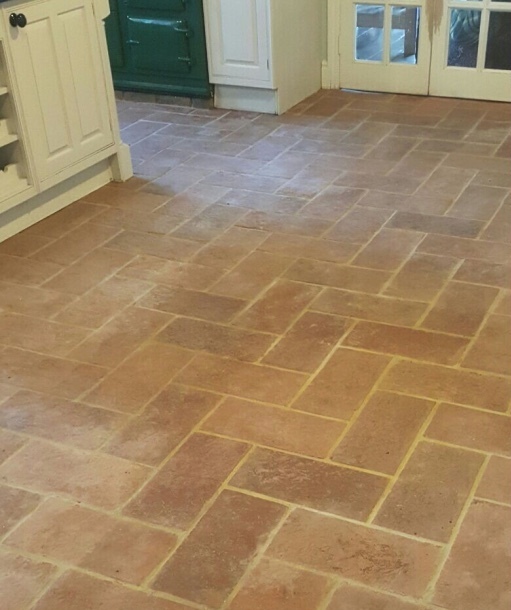 The pictures below were taken at a beautiful Hertfordshire Lodge located on the outskirts of Welwyn Garden City where the traditional Terracotta Kitchen floor had lost its appeal and was now in need of renovation. Welwyn Garden City is actually a new town that was created in the 1920 with an aim to create a modern garden city, the architecture is therefore fairly modern. As usual the first step before starting the cleaning process was to clear the floor of as move furniture as practical and use protective tape to cover the threshold edges, skirting’s and doors and use a protective sheet to the fixed kitchen units. 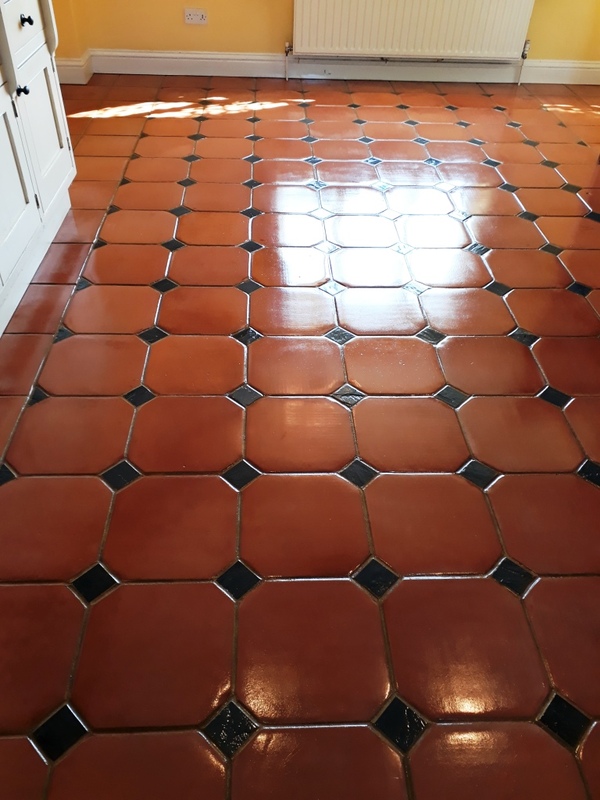 To deep clean the Terracotta tiles and remove any trace of old sealers and waxes present a strong dilution of Tile Doctor Remove and Go was applied to the floor and left to soak in for about ten minutes. Then the solution was agitated using detail brushes along the grout lines and edges and polypropylene pads. 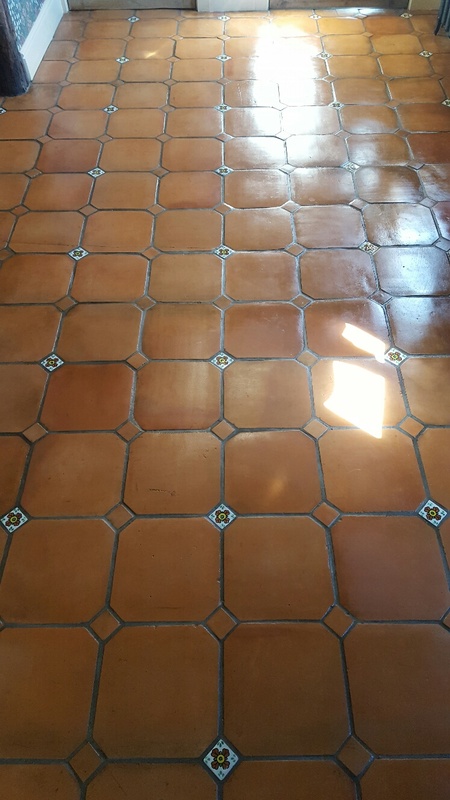 Once done the now soiled cleaning solution was extracted from the floor using a wet vacuum and the tile and grout rinsed with fresh water. 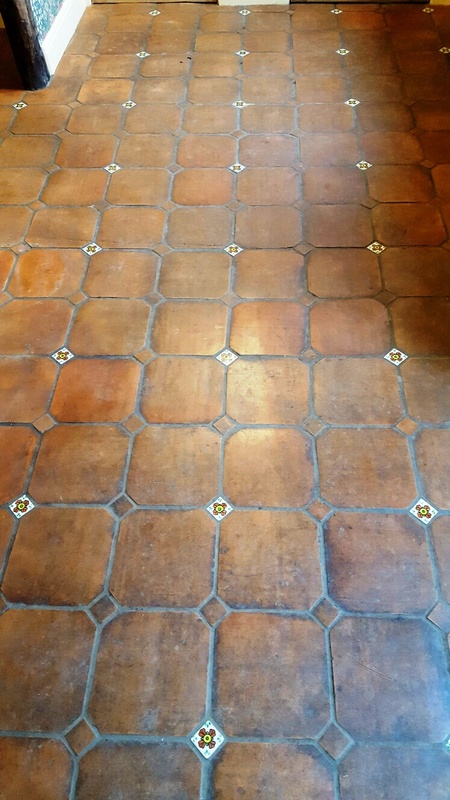 This process removed most of the dirt and old coatings but more work was required so a further treatment using a strong dilution of Tile Doctor Pro-Clean which is a strong tile cleaner and sealer remove was applied and worked in using an orbital floor machine fitted with a scrubbing pad. Again the soiled cleaning solution was removed using a wet vacuum and the tile and grout given a steam clean to remove any trace of cleaning product residue. The floor was then left for two days to fully dry out. On our return the floor was checked for dampness before we proceeded to seal the floor; sealing damp tiles can result in a patchy finish so this is always worth checking. 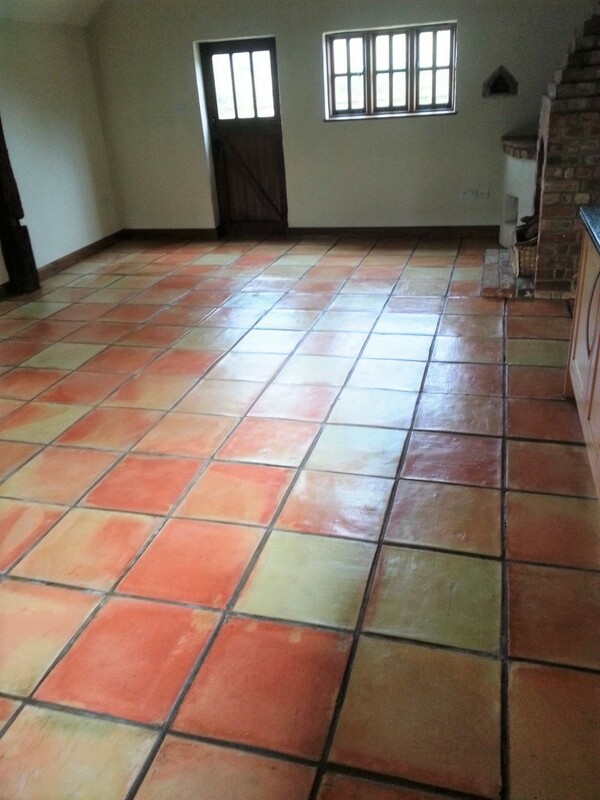 To seal we gave the Terracotta tiles a primer coat of Tile Doctor Colour Grow which is an impregnating sealer that brings out the natural colours in the tile and by occupying the pores of the clay tile it stops dirt becoming ingrained. 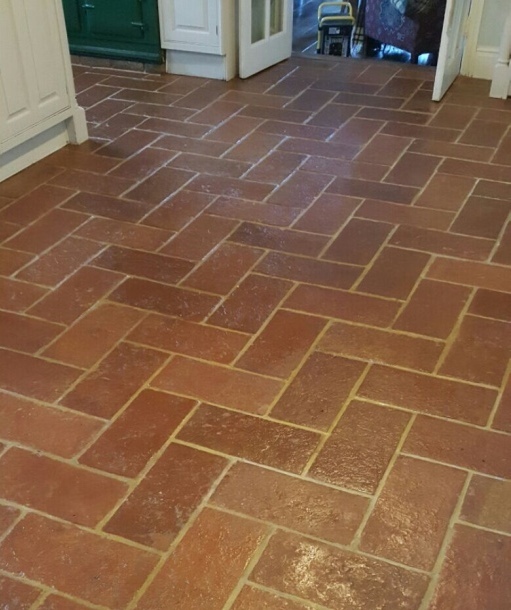 This was then followed by six coats of Tile Doctor Seal and Go which works really well on Terracotta and adds a nice satin sheen finish. 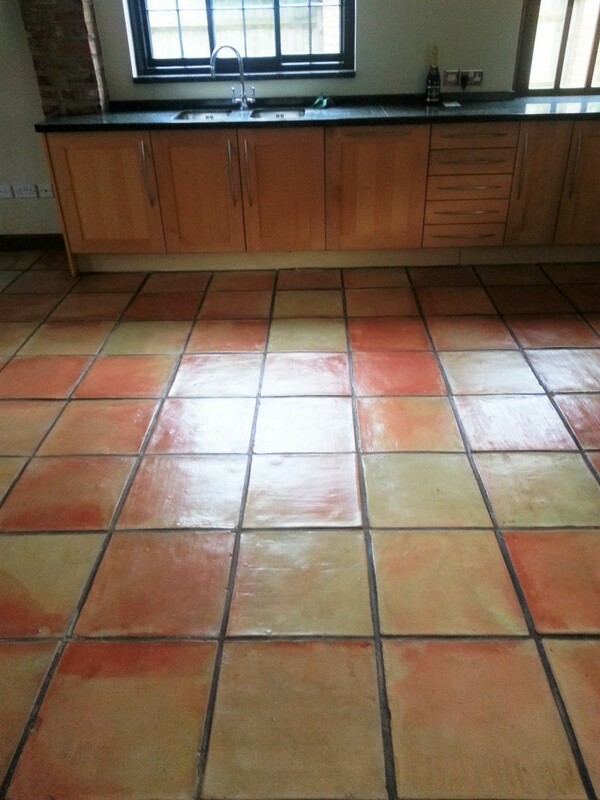 The floor now looks much healthier and has really lifted the appearance of the kitchen. 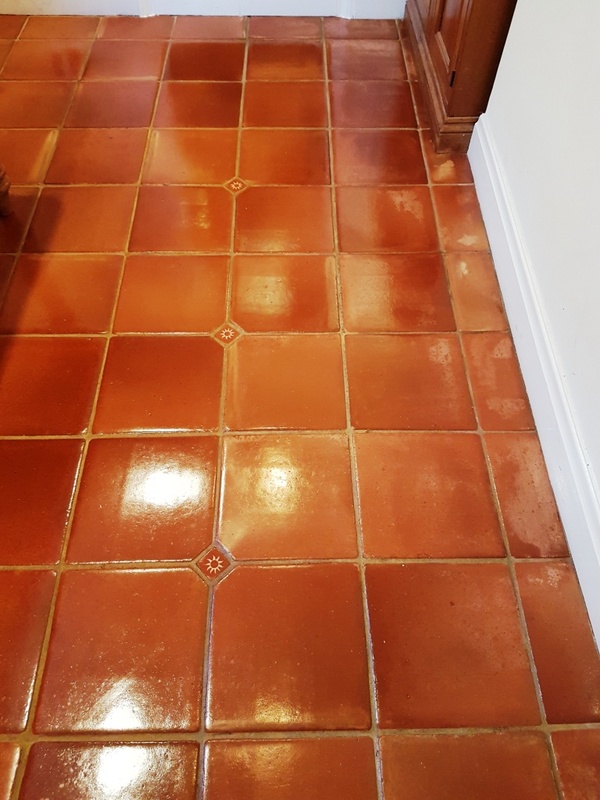 Before leaving we advised the customer to avoid commercial acid based cleaning products as these are not appropriate for sealed Terracotta tiles. 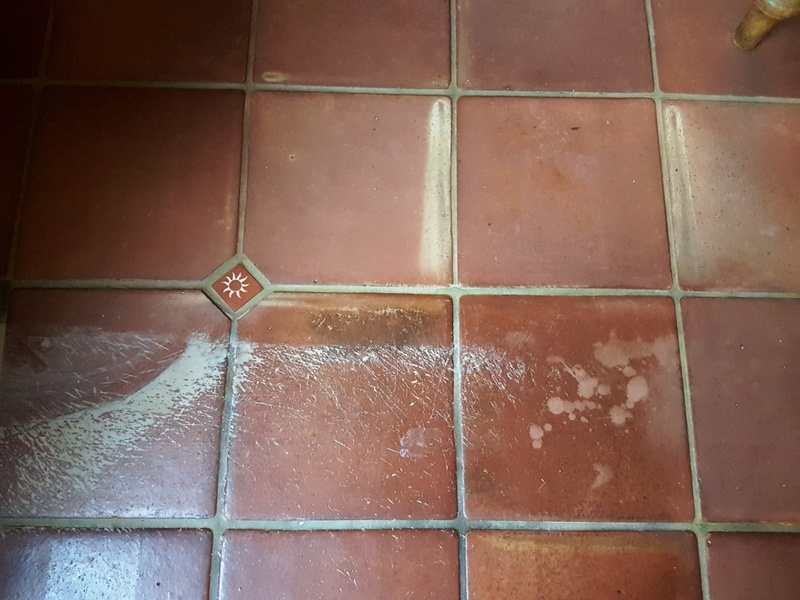 We suggest using a low alkaline/neutral PH product such as Tile Doctor Neutral Tile Cleaner as this will maximise the life of the sealer and maintain the sheen of the tile.